If a volcano erupts on the seafloor and nobody is around, does the eruption make a sound? For oceanographers, this is more than a philosophical problem. Earthquakes and eruptions take place all of the time along the vast mid-ocean ridge system. However the chances that an oceanographer can be at the right place at the right time to witness an eruption or even find evidence of a recent eruption are remote. Now it is possible to hear seafloor eruptions without having to be there. Marine seismologist Maya Tolstoy and her colleagues are using underwater microphones called hydrophones to listen for earthquakes and eruptions and then pinpoint their locations. 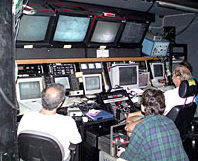 Maya interprets sonar images at sea with a colleague. All earthquakes produce a series of seismic waves that travel through the earth. Primary (P) waves are the fastest waves and move through solids and liquids. The slower secondary (S) waves travel only through solid materials. Seismologists traditionally locate and study earthquakes by measuring the magnitude and timing of these two types of waves. Maya and her colleagues, however, are taking advantage of third type of wave produced only by underwater earthquakes. These tertiary (T) waves can travel thousands of kilometers within a layer of the upper ocean called the SOFAR channel. Hydrophones deployed in the SOFAR channel can record even small earthquakes throughout the entire ocean. Maya on the deck of the RV Maurice Ewing helping to deploy hydrophones. The United States Navy originally deployed hydrophones to detect enemy submarines. After the cold war, the Navy gave scientists access to their hydrophones. 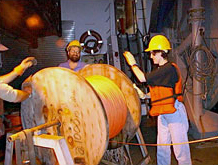 In addition, scientists from the National Oceanic and Atmospheric Administration (NOAA) set out additional arrays of hydrophones in the eastern Pacific and the North Atlantic. About once a year, scientists and technicians journey out to these hydrophones to download the data and change the batteries. Maya and other scientists are using these hydrophones to monitor earthquakes on the Mid-Atlantic Ridge and locate recent underwater volcanic eruptions in the Atlantic and Pacific Oceans. By zeroing in on the most seismically active areas, geologists will be able to better understand the processes shaping the mid-ocean ridges. 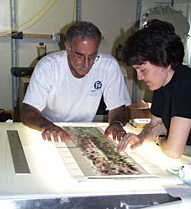 This work also promises to help biologists who want to witness the impact of the eruptions on the biological communities on the ocean floor. For example, biologists will be able to study how organisms recolonize recent eruption sites. At sea Maya and other scientists monitor deeply towed instruments within the control van. Tracking down volcanic eruptions, however, requires more than just listening for seismic activity. One of Maya’s greatest challenges is figuring out whether the sounds that hydrophones have picked up are due to tectonic events (earthquakes caused by movement of plates) or magmatic events (volcanic eruptions). The interpretation is not always easy. One pattern that Maya looks for is whether or not the source of the earthquake changes over time. A tectonic earthquake and its aftershocks usually remain centered in one area, but earthquakes caused by an eruption often migrate due to the movement of the magma beneath the seafloor. 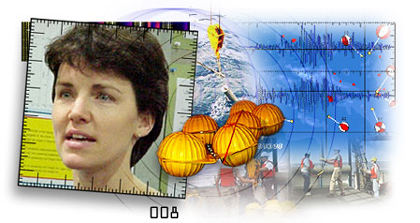 In the spring of 2000, Maya helped lead a cruise to the East Pacific Rise to examine several sites where, based on the hydrophone data, they thought eruptions had taken place. Although what they found was not always straightforward, they did see evidence of recent eruptions at a couple of sites that matched the timing of the signals that the hydrophones recorded. These findings will help Maya and other seismologists refine the technique of using hydrophones to study seafloor eruptions and earthquakes. Read an interview with Maya. Get more info on Maya's background. See images of Maya at work. See Maya's typical work week. Other sites related to Maya's career.